Fifteen domestic companies based in non-RTW states announced investments in RTW states. Just one announcement went the other way. RTW prevailed in foreign direct investment (FDI), too. 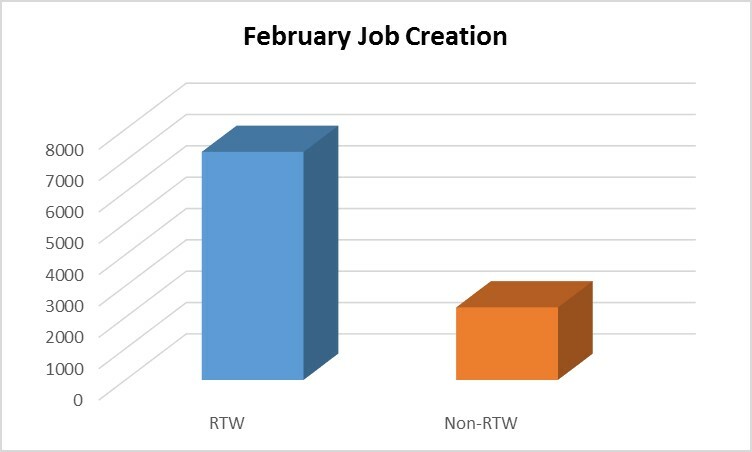 Nine projects are headed to RTW states, with seven to occur in non-RTW states. Marquee RTW wins included a manufacturing facility for Rhode Island-based Textron Specialized Vehicles in Georgia (400 jobs), the decision by New York-based NBCUniversal Telemundo Enterprises to build its new headquarters in Florida (150 jobs), and Swiss-Canadian startup GF Linamar’s pick of North Carolina to make “light-weight powertrain, driveline and structural components” (350 jobs).